It’s August 31, and I made it. Yesterday was the tenth day of the month that I did not drink. It was (mostly, but not always) hard. I was going to mention that when there were two consecutive nondrinking days, the second one was easier. Except the last time, it wasn’t. The last time, I really really wanted to chill out at happy hour on day 2. But I was sure if I gave in that day—the potential ninth day, when I very specifically wanted a hoppy beer and bit o’ bourbon, when there were so few days left in August and an entire weekend ahead of me—that I would fail. So I toughed it out. If I can get through dinner—past happy hour, past wanting to pair wine or snooty beer with my meal—I can do it. It’s probably helped (a little) that I’ve been watching Brideshead Revisited and Sebastian’s demise. Some friends found this experiment of mine somewhat arbitrary, especially as they don’t perceive me as drinking a lot, and because many of them believe a drink or two a day is fine, possibly even healthy. It is an arbitrary experiment, of course. I can pick any ten days in the month, and I’m only trying to do this for two months. I don’t drink a lot (compared with people who drink a lot). But I do drink often. So let’s tap the brakes a little and see what happens. Here’s what I still believe: I have a happy hour addiction. Am I a fish? Well, I’m a Pisces. And I make part of my living based on the fact that some people are obsessed with this particular animal. As most of you know, I enjoy my cocktails, my wine, my beer, my hard liquor. But do I drink like a fish? I don’t think so, but sometimes I worry that I drink too often. Near the end of July, I hatched a plan to cut back. By one third. In terms of number of days drinking. The last week of July, I managed it: I took three days of seven off. The plan is to not drink on ten calendar days in both August in September. That should be easy, right? It can be any ten days. I still get to drink twice as many days in the month as I don’t. Some of my friends don’t understand this exercise. A drink or two a day is perfectly fine, they say. Basically, I agree. I just wonder if I can do it. Because, you see, I know I’m addicted to ritual. I love happy hour, sitting with Tim or friends at the end of the day, imbibing and unwinding. Obviously, I love alcohol too—but I don’t think that I’m addicted to that. I think I just like it a whole lot. It’s August. It’s the end of summer. I could say I’m occasionally drinking, because it turns out August is full of occasion. I have eight more chances to add days to this month’s tally. Each week I think “Maybe I won’t buy so much this time.” Each week I say “I need to save money.” Then, on Wednesday morning, the fish runner emails the list of this week’s two or three offerings. We have til 5:30 to order for Friday delivery. Each week I cave. And usually I buy more than one thing. I have a baby octopus and two pounds of kickass shrimp in the freezer. The thing is, the prices are really good. However, just because the prices are good doesn’t mean I can really afford it, especially given my upcoming travel plans. On the flip side, I know this won’t last forever. Nothing does. I am living in a brief moment when fresh fish is practically being delivered to my doorstep. I want it. I’m addicted. My understanding is that there’s a guy in Boston who buys for restaurants between here and there. Our fish runner meets the Boston buyer in a town about 65 miles from here and brings our order back. On Valentine’s Day, fresh oysters were shucked down at the farmer’s market. We made a mignonette, shared it around. It was a good day. There have been other offers of oysters, but I’ve never (ahem) learned to shuck myself. Most of my oyster consumption happens in Portland bars. I don’t get the lobsters either, mostly because I’m in denial about taking responsibility for killing my own meat AND I’m not really into the whole-lobster thing. Give me a lobster roll or grilled tail. Here are some things I’ve been able to order over these months: black sea bass, haddock, scallops, mussels, clams, squid, octopus, smoked bluefish, swordfish, tuna, sockeye salmon, halibut, pollock, salt cod, shrimp, flounder, monkfish, skate, mahi, red snapper. Am I forgetting anything? Probably. This operation seems to care about sustainability, often informing us as to how something was [allegedly] caught (especially in the case of those fish you know have been on endangered lists). This week I ordered scallops for Tim and salt cod for me. Nothing like a good brandade…although it may be awhile before it’s cool enough to prepare it. We walked across the street, and Martha showed us the nest near the top of the Japanese maple. (I first wrote her Japanese maple, but suddenly that sounded like a euphemism.) Thom joined us and reported that the parent was grayish and had a crest. I was looking for tufted titmice. But the babies, as best as I could see them underneath, didn’t look like titmice. For the briefest of moments, I thought they might be robins. But then I caught a glimpse of mask. Cedar waxwings! 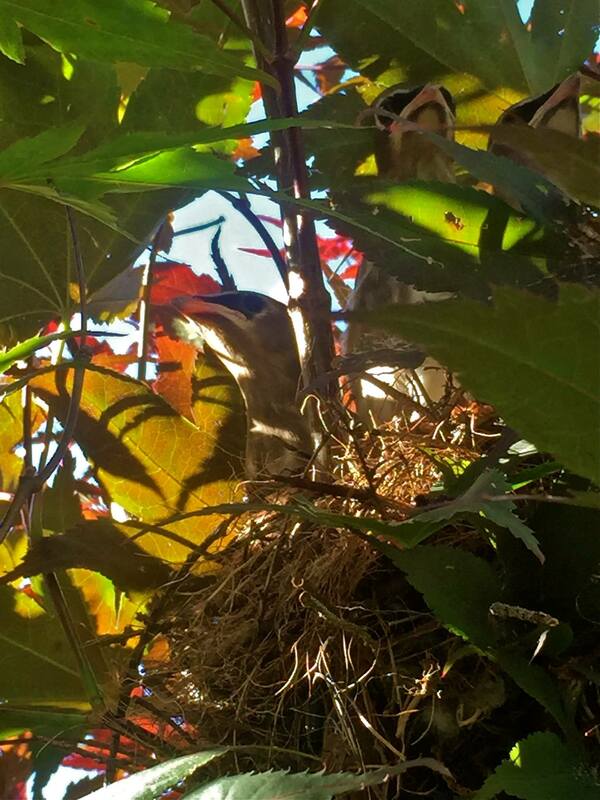 We Googled “baby cedar waxwings,” and there could be no doubt that’s what they were looking at. And then the mama showed up and hovered, and glared at us. It’s been four days. I wonder if they’ve fledged. *Dona is our own Cedar Waxwing, of course.